Western Bottle News: Western or ? 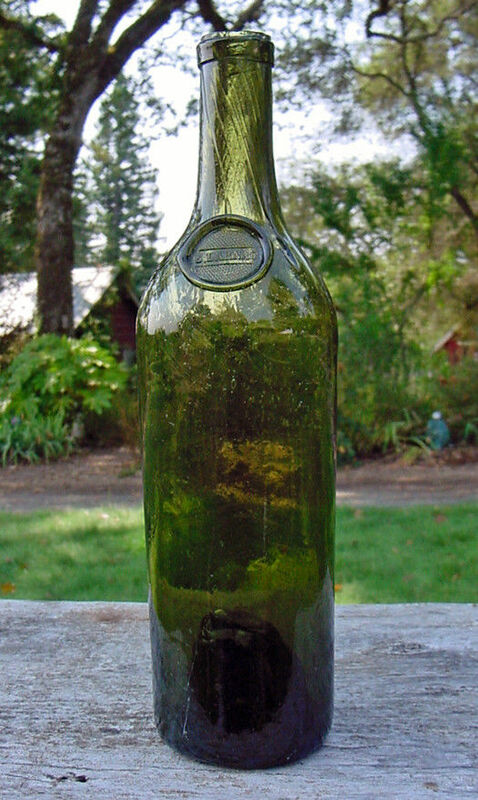 The description of this wine bottle includes "I’ve often suspected these were a Western product because of where their found and some recent research may confirm that". 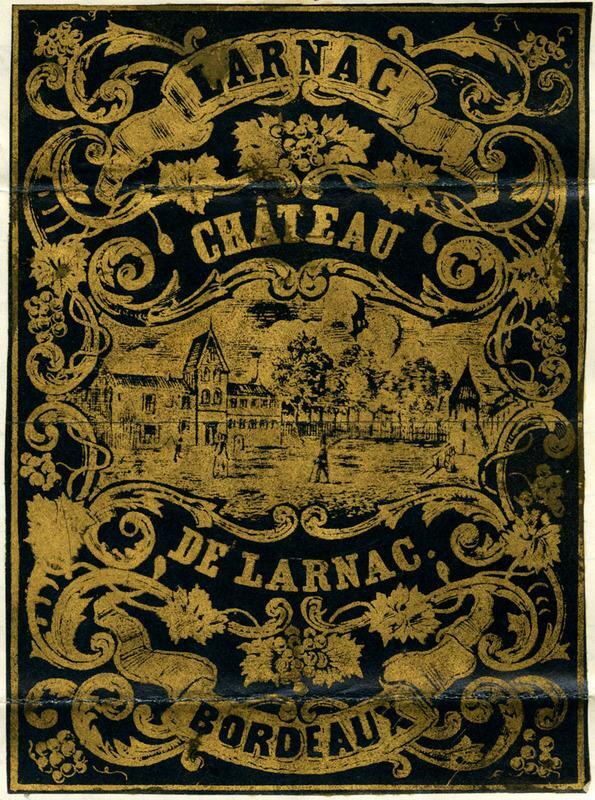 The description includes "In 1868, Wine merchant Adrien Chauche of San Francisco filed a trade mark for the "LARNAC" wine label pictured. 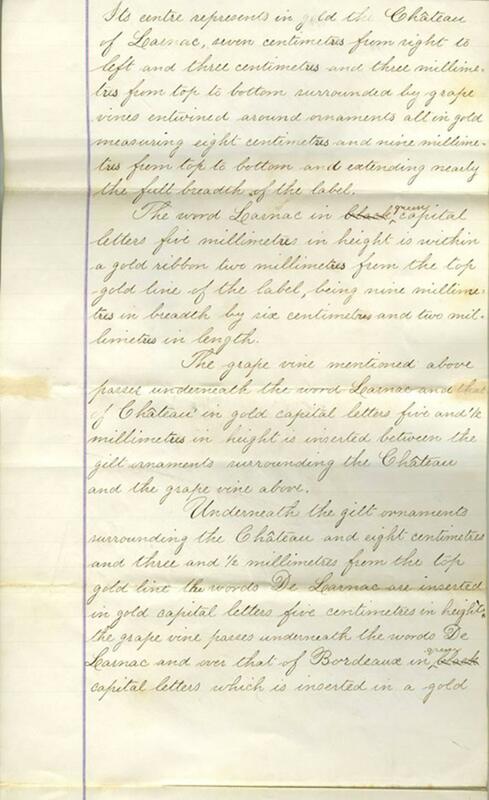 The date of this filing is very close to the context the bottle was found in, late 60s. The few of these I know of were all found in Northern California". The description concludes with: "Likely a product of the “San Francisco Glass Works. While not 100% certain this is a Western wine, the research certainly seems convincing". 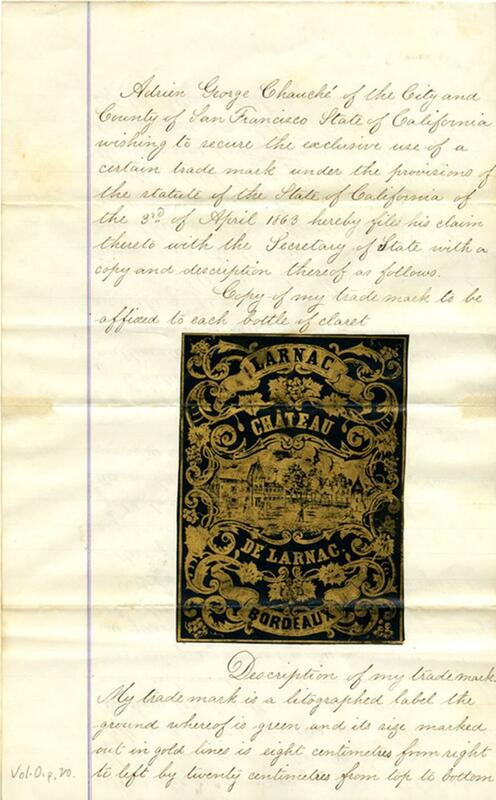 I was interested in this bottle and did a little research on the San Francisco Glass Works and the Larnac trade mark. The San Francisco Glass Works ( Newman & Brannan) was destroyed by fire on July 23, 1868. 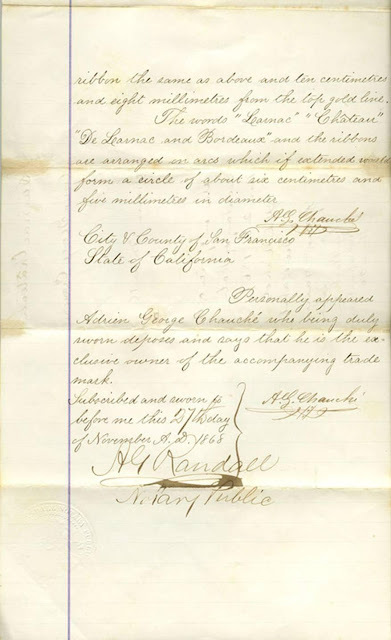 It was not rebuilt and back in operation until September 23, 1870. According to the California State Archives S. Lognac and S. Larnac are attributed to the Bordeaux region of France. Reproduced below is the trade mark for the Larnac label filed on November 28, 1868, over four months after the SF Glass Works was destroyed. Several years ago I purchased a grouping of bottles, primarily OP foods, that had been surface found above Oroville on the Feather River by a timber faller. There was a “one off” black glass sealed bottle in the bunch. It was identical to Lou Lambert's ebay listing of the S. Larnac, with one slight difference; the seal was embossed “S. Lognac”. Another bottle in the mix was a free blown aqua wine with a deep kickup. The label was gone, but the pattern on the paper label had imprinted into the glass, (much like acid etching). The label was in French. The similarities between the S. Lognac, and the S. Larnac bottles have to be more than coincidental. Turned with the seal facing away, they were virtually identical in size, form, base configuration, and glass blowing technique employed. 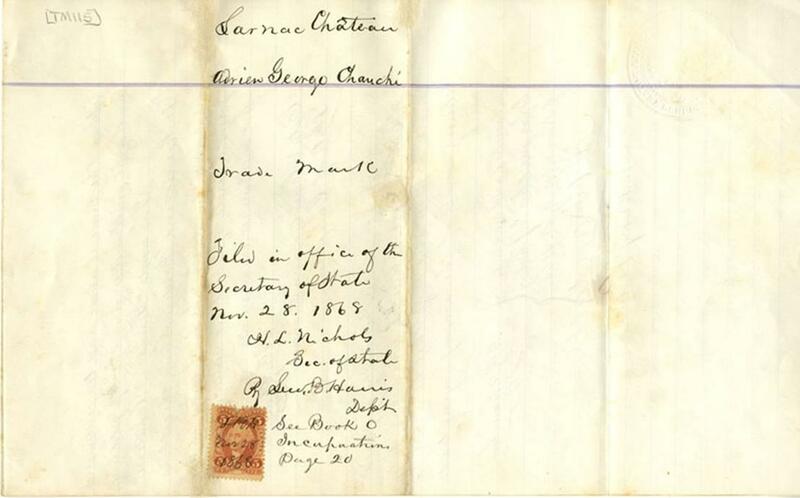 Even the pattern of the cross hatching on the seal in the field surrounding the embossing was identical. This is a French bottle. Larnac is a town in the Languedoc-Roussillon region of France. It is not part of the Bordeaux region. If the bottle was western made the seal would say "Larnac / Bordeaux" or "Chateau / Larnac" to match the label. Instead it has the generic "S Larnac" probably from the French town in southern France. 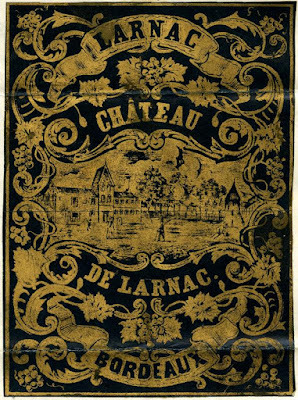 I suspect wine from Larnac was bottled and sold as Bordeaux, almost nobody in California would be able to tell the difference. It was very common practice for Bordeaux wine to have wine from Southern France blended in. This boosted the color and alcohol and this was very important in cooler years. In poor years it could mostly be from Southern France. I think it unlikely that wine from France would be shipped in barrel around South America and bottled in San Francisco. The travel time would be about five months minimum to go around South American. A table wine would probably spoil in that time from the heat and air getting into the barrels. I think it was shipped already bottled, then labeled by the wine merchant. Aqua N. Van Bergen Gold Dust, 1880 and newer?